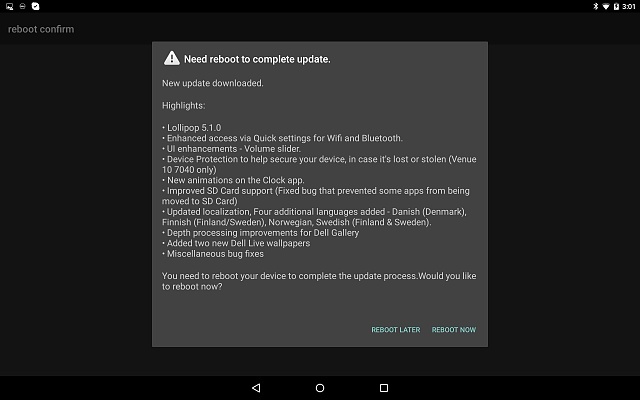 Lollipop 5.1.0 Released for Venue 10 7000! Just got the push on my tablet today to upgrade to 5.1.0. It also has a few other bug fixes, enhancements, and even some new live wallpaper. Otherwise no major cosmetic changes. It's still nearly stock android that runs pretty darn well. Just got my tablet last week. Immediately updated to 5.1 without a hitch. Everything seems very smooth. Bright, clear screen. I disabled the touchpad to avoid accidental touches and it's not a disadvantage. Touching the screen is just as effective. Keyboard is responsive and not at all cramped. All in all, very satisfied with the tablet and the upgrade. Does the venue 11 7000 run Android? I thought it runs windows. The Dell Venue 11 Pro 7000 runs Windows. The Dell Venue 10 7000 runs Android. Yes, this thread is titled wrong, but Dell's naming system is horrendous and confusing, so it's kinda understandable. Yeah, just a typo! Fixed the title. I just recently received mine, but every time I go to the settings to check for a system update, it tells me it's up to date and it's only on 5.0.2 out of the box. Still no 5.1 for me, stuck on 5.0.2. Is there a fix for this? Insufficient storage after lollipop 5.1 update.